Instructions: Cut a piece of white cardstock 10" x 7", score at 5" along the long side and fold to create a 5" x 7" card. Cut a piece of pink patterned paper 5" x 7" and adhere to the front of the card. Die cut the inner and outer decorative die from the HCD2-7192 Eyelet Lace Frames Die set in gold mirror card and adhere to the front of the card. Stamp the image from the HCPC-3608 Arianna Blooms Stamp set in Magenta Hue ink on Super White cardstock. Colour in with Sunflower, Tea Rose and Magenta Hue inks before die cutting with the coordinating die. 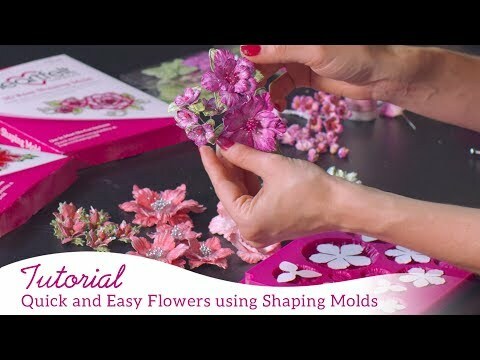 Shape using the 3D Basic Flower Shaping Mold and allow to dry before assembling. Add Prisma glitter to the flowers and gold Party Balls to the centres of the flowers and adhere around the bottom left of the card. Stamp the leaf images from the HCPC-3835 Leafy Accents Stamp set in Library Green on Super White cardstock. 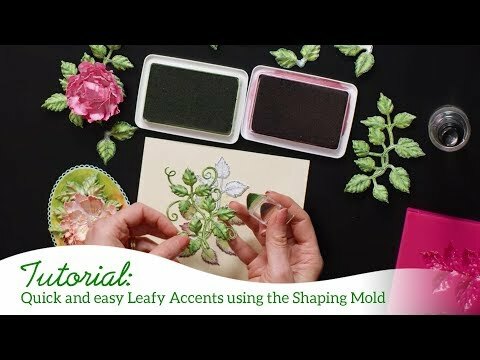 Colour with Leaf Green, Fern Green and Magenta Hue inks and die cut with the coordinating dies. Shape using the coordinating mold and add Prisma glitter once dry. Adhere around the flowers as shown. Stamp the leaf image from the HCPC-3811 Rainboots and Blossoms Stamp set in Fern Green ink on Super White card and colour with Leaf Green. Die cut with the coordinating die, shape, trim and adhere around the flowers and rose leaves. Stamp the heart leaf image from the HCPC-3811 Rainboots and Blossoms Stamp set in Fern Green ink on Super White cardstock. Colour with Leaf Green and Forget-Me-Knot inks and die cut with the coordinating die. Trim and adhere around the flowers and leaves. Stamp the image from the HCPC-3851 Handstitched Accents Stamp set in Versamark ink on the Ivory cardstock and emboss with gold embossing powder. Die cut the sentiment using the second smallest arrow die from the HCD1-7204 Arrows and Banner Die set. Adhere the arrow to gold mirror card and trim to create a mat. Adhere the sentiment to the card as shown.